For today, we’ll stick with hair. ‘No Poo’ refers to washing your hair without shampoo. Yep, this dirty hippy girl doesn’t use shampoo. …let me clarify! I am not. I bathe, I wash my hair… just not with shampoo. There are oodles of other things that you can (and should!) use to wash your hair. You keep a really clean diet – why put that stuff on your skin? Newsflash: your skin covers your entire body, and it’s an absorbent little sucker. If you wouldn’t put it in your body, don’t put it on your body! If it’s ‘natural’ – it’s probably not. And some ‘natural’ things can be pretty durn scary too. If it’s genuinely natural and harmless – it’s probably really expensive. You have stuff in your kitchen pantry that you could use instead!!! The shampoo & conditioner cycle really messes with your head… Shampoo strips your hair of the natural oils, and conditioner replaces them. All this leads to one very confused scalp – to produce oil, or not to produce oil? Easy peasy. Cheap. Natural & toxin-free. Convenient. Simple! I used to shampoo. And I used to condition. And I used to use all kinds of styling products that left my hair constantly wet, crunchy, crispy, overly stiff, frizzier than when I started, greasy, and/or just plain weird. Because I have crazy ridiculous hair that didn’t like to do anything I wanted it to curly hair. I had read about the No Poo method – just caught snippets of articles for years. But never really thought it was something I could do. My hair is definitely on the dry side, so I thought surely I neeeeeeed conditioner for the oils! Then a few things happened, and you better believe I was proven wrong. I decided (with some convincing from friends) to grow my hair out again. I was loving my long locks, but growing increasingly discontented with the fact that I couldn’t find a shampoo/conditioner product range that I was perfectly happy with. I was using a natural-ish shampoo, the best I could find, and then one day… My local organic store stopped stocking it. This was exactly the final push that I needed. I decided to embrace the No Poo method, to at least give it a whirl, even though fears of a transition period lurked in my head (see bottom of post for explanation). I started using bicarb soda and apple cider vinegar and nothing else to wash my hair. And my hair LOVED it! My hair took to it like a duck to water and I felt liberated. Liberated from the grips of commercial and chemical-laden shampoo & conditioner! I made the change a good year or two ago, and I’m still going strong. Oh, and I only need to wash my hair ‘properly’ (using the following method) about once every 1-2 weeks. In between, I just rinse with water straight from the shower nozzle. 3) Apply almost all of the bicarb soda evenly to your scalp and roots by wetting your hands, taking a small handful, rubbing hands together to create a very thick paste, and massaging evenly over scalp (working in sections). 4) Grab the last handful of bicarb soda, rub your hands to create a thick paste, and apply from the roots down the length of your hair (you only need to do the top approx. 5cm of your hair). 5) Massage scalp well once more, and rinse thoroughly. 6) Fill a small bowl with approx. 1/3 cup apple cider vinegar and top up with 2/3 cup water. Grab the ends of your hair together and dunk into the bowl (getting as much hair in as you can), then pull your hair out. 7) Top up bowl with a little more water (to even further dilute the apple cider vinegar), then pour over your hair to rinse, starting from the scalp. *beware not to get it in your eyes – tilt your head back! 8) Add 1/4 cup of apple cider vinegar to your bowl and top up with 3/4 cup water. Rinse your hair by pouring over. 9) If you have long hair, repeat once more. 10) Rinse thoroughly with only water. 11) And a bonus, this is the drying method that works well for my hair: Gently scrunch dry with a towel (if you have curly hair, pleeeease don’t rub it dry), wrap your hair up in a towel for 30 mins so it stops dripping, then let it down and air dry. I always wash my hair in the evening and go to bed with it just slightly damp, as I find that by morning I will have much neater and better set curls than if I just let it air dry. HOT TIP: If you have lots of thick, really long hair like I do… this is all so much easier in the bath rather than the shower. Once your hair is dry, there is NO lingering apple cider vinegar smell. If you want that shampoo-y smell, either fill a spray bottle with water and add a few drops of your favourite essential oil and spritz with that before air-drying… or if you’re feeling really indulgent, spritz with diluted rosewater. I don’t regularly spritz with anything, because I like to cut corners & save money, but also because people already tell me my hair smells nice so I don’t bother. This post was written for the amazing 31 Days to Better Health and Wellness Challenge. It’s not too late to join us! Click over to read all about it and sign up. Thanks for your awesome tips Orleatha! You have gorgeous hair! How exactly do you use the flax gel? Do you spray it on your hair when they are wet, after washing? Do you comb it through? I am a bit confused … Can you please explain? Hi, do you know if you can go from your method to only water after a while without a serious transition period? My kids’ hair have never been washed with anything (except the ocasional granny ‘treat’). I only rinse their hair with water and they have beautiful soft and shiny hair!! Even after a swim in the pool or ocean. So I was just wondering if I went from shampoo to your method, if there would be some stage where I can just use water as well? Don’t know if you have tried it, and if it would work. I have very similar hair to yours by the way. I couldn’t tell you for sure, as I haven’t done the water only thing. My guess would be that there would be a transition, but I don’t think it would be as bad as the transition from shampoo to bicarb & vinegar. I would give your hair plenty of time to adjust to bicarb & vinegar before trying to move to water only. My hair stays dry on the ends, but the roots get a little oily after a week or two (depending on weather and activity in that time range) – if your hair is much the same, I think you will need to brush it more often when you transition to water only, to help the oils move down away from the scalp. And wash more during the transition also. A side note – no matter which washing method you use, if you have curly hair like mine, always brush dry before you wash. Never brush curly hair when wet, it’s more prone to breaking which then leads to more frizz. I tried no poo for about 4 months but my scalp STILL hadn’t made the transition I finally switched back to ‘natural’ shampoos because I couldn’t take the grease anymore! I tried multiple ratios of bicarb soda/vinegar but nothing worked. I have thick, wavy, dry hair and a very sensitive scalp/skin on my face. I’d love to go back if you think there’s any hope! I’ve been using the no-poo method for about a year now. At first I was super frustrated with it because I hadn’t figured out what worked for my hair. My method is a bit different then the one described here. I mix the sodium bicarbonate (baking soda, Bicarb Soda) with water saturating it (almost all the baking soda dissolves). I use this as my “Shampoo” squirt it on my hair from a squeeze bottle. Massage it in then rinse out. I also use a apple vinegar rinse mixed in water (VERY little vinegar). Then rinse with water. During super oily days I have a backup plan! Ok maybe this is cheating but it’s either this or shampoo and I would rather not go back to that. I use “dry shampoo”. I have a small jar filled with cornstrach. I use a powder make up brush and in sections apply powder to my scalp. Just make sure you get all the oily parts not just on top. Then you need to use a boar hair brush(maybe others would work, but it needs to be dense to pick up the cornstarch). Brush your hair until most of the white look is gone. After you are done shower. Wonderful less greasy hair! Recently I have gone 2 months without having to ungrease and I still don’t need to. I’m glad you’ve found a no poo method that works for you. Keep it up! Hey, has anyone experienced a decrease in curls with this method? I have been doing the no poo method for a couple of months now, and I really like the principle of it, but It seems like my hair has less body with less ringlet-type curls and is more dried out with more split ends than before. I have wavy/curly hair that is not particularly oily (even before no poo I could go a week between washes). I would appreciate any insights/comments! Thanks! Hi Katie. Thanks for your comment. My hair is still just as curly as before… Are there any other things that could explain your change in curls? Big diet change? Hormones? If it seems more dried out, I would try washing even less often with the bicarb/acv and/or reducing the amount of bicarb/acv you use. Hope that helps!! Thank you for this great post! Do you use (or make) any styling product? I have chin-length curls and feel nervous about not using any styling product. I have been doing this for a few months now and love it. I have read alot of methods that say to brush your hair to spread the oils. I have very curly bouncy hair and do not brush it. I do use a wide tooth comb in the shower when wet but that’s about it. Thoughts? I’ve started the no poo method a little over a week ago and had an awful transition, although it seems to have gotten a little bit better. I have not used baking soda though, and will try that out. I had just read a few random articles, mostly of people who did not wash their hair with anything at all. I decided to use diluted Apple cider vinegar at least, but I was using it all over my scalp and hair…(maybe that’s making it oilier?). I was wondering though, because I read so much about boar bristle brushes and brushing hair a lot, does your hair get tangly in between washes without combing or brushing it? I have pretty tangly, frizzy curls, and I was using a Wet Brush to detangle my hair when my hair was wet or dry…. (didn’t realize it made curly hair frizzier to brush while wet). I see that you mention you usually only brush your hair before you wet or wash it. Do you have a recommendation on a good brand or type of brush? Hi Victoria. Sorry for the delayed response! As per my edits to the post above, I now only use apple cider vinegar on my hair as the bicarb led to some yucky effects over time (very dry/brittle and broken hair). However, I would recommend bicarb during the transition period to help break down the oils as your scalp overproduces. Once oil production settles, move to apple cider vinegar only. My hair seems to be doing much better with vinegar only. I have a cheap plastic brush, have never tried a boar bristle one so can’t comment on that. I rinse in the shower between ‘proper’ washes, and usually brush my (dry) hair before that rinse to distribute the oils a bit. My hair gets a little tangled sometimes as it is so long and curly, but not terribly so. I found this really helpful thank you, I’ve always struggled with build up near my scalp and really dry ends so really looking forward to trying this. However I was wondering if you ever style your hair, or use a heat protector, hairspray or any styling products? I was wondering if you do what could you use without ruining it? Thanks your website is amazing, I love it!! Inspired by your post i am about to start this no poo thing. Can you let me know how to prepare for it.? And i sweat a lot due to work out, how many times will i need to wash my hair? And when n how to comb your hair? I don’t think there’s really anything special to do to ‘prepare’ for it, but know that you will probably have to wash quite frequently at first to get through any oil build up/transition phase. I can’t really tell you how many times, everyone’s hair is different, so you’ll just have to take it as it comes (with the knowledge that more frequently does help at first). Same with combing, it will be different for everyone. If you have straight hair, then brushing more often is a good thing. For people with curly hair, they will usually brush less often as it all just turns to frizz when you brush. I brush right before I wash my hair (whether it’s just a water rinse or an apple cider vinegar wash). Hope that helps. As I wash ‘properly’ so infrequently, I simply brush my hair well before I shower and do a shower rinse (literally just stick my head under the water, no vinegar etc) to ‘re-set’ the curls. I started doing no-poo (baking soda and acv) about 2 months ago and is going okay. The issue I have is that my hair too is curly but with oily roots, and the only way to distribute the oil is to brush it. The problem is that destroys my curl! Any ideas? I brush it quite frequently and it looks better (less greasy scalp) but then my curls turn frizzy! I do a water-only rinse every time I shower, so you could brush right before you hop in the shower as when you wet your hair it will re-set the curls. Alternatively, spray your hair liberally with water from a spray bottle after you brush, although this won’t be quite as effective. Thanks for sharing your no-shampoo method. I have dry and somewhat curly hair (I’d love for the curls to be curlier), and I’m planning to start no-shampoo today. Do you use any particular kind of apple cider vinegar? Have you used any other washing methods, like rye flour or clay? If so, thoughts about how they worked for your hair? I haven’t tried any other methods yet, although I am meaning to. Actually, I did try washing with honey once, but I was NOT a fan of the result at all. I use unfiltered apple cider vinegar from a company called Honest to Goodness (www.goodness.com.au) as it’s the cheapest good quality ACV that I can get. I buy it in 5L bottles! do we have to keepthe apple cider vinegar in a fridge? for exampleif I go on vacation for two-three weeks and I don’ t have access to a fridge, is the vinegar goingto turn bad? I have lots of fine curly har and I wanted to know if this was doable for a curly hair girl, seems it is! thanks for your post. Hello! thanks for the tips. Is it bad to use gel afterwards? I am wondering if anybody colours their hair on this method? I am quite grey now and am not ready to stop colouring it! How does the colour get washed out or how does it affect the process? Does anybody tell their hairdresser to just rinse?? Thank you ! I’m really keen to start this no poo method. I have oily hair, I think. I wash it one day and by the next day it’s be oily and my curls would flatten out. So I kept washing it everyday. I’m sick of this so time to do somthing. After reading your instructions, If I wash my hair with the baking soda and rinse with acv, how do I know when the transition period is up? Do I wash my hair every day with the baking soda and acv? Thank you for the specific info Sarah!! I am going to begin tonight! I also have long, thick curly hair. Mine is really dry too :(. Question…do you ever blow you hair straight? No, I don’t – I have way too much hair to bother, haha! It would take me aaaages. My hair is similar to yours in curls and color. I have been No poo for nearly two years now, i started with Co washing, as i love the feel of conditioner, now I am using only water and ACV, but I feel I need something to help me with frizz later in the day, the hair starts out good but as the day goes on the hair gets frizzy and the curls “un” curl them selfs, any idias? Hmmm…. Possibly some oil during washing, if your hair runs on the dry side? Coconut oil would need to be washed out though, otherwise your hair will stay really oily (but I reckon enough would stay in to help out). A lot of people seem to love Argan oil, but I can’t say I’ve tried it before. I daresay your ends are a lot drier than your roots (my hair is like that too), so I’d say your best bet is to find a way to moisturise the ends. Hope that helps! I am ready to give this a try! I was reading through the comments and I’m shocked to read that you brush your hair when it’s dry! I haven’t brushed my hair dry since I was a kid because it’s so knotty and I can hear the hair breaking when I do that. I’ve always combed it when wet. Have you always done it this way? HI I’m Stephanie and I barely started using the no poo method but my after my curls dry they get super dry and crunchy. What should I doo???? Also how often should I wash my scalp if it gets sweaty often? If you’re using bicarb soda, try to wean yourself off it (so that you’re just using apple cider vinegar). I found that over time the bicarb soda was extremely drying for my hair and made it really brittle and prone to breaking. Wash your hair as often as your hair tells you to – that’s my unofficial mantra! I do water rinses in between apple cider vinegar washes, which rinses out the dirt/sweat so that it doesn’t build up too much between washes. I do my apple cider vinegar washes when it starts to get greasy – every week or two, usually. Hello! I need help! I stoped using shampoo on october last year. My hair was beautiful por a period after the transition, but now my hair is awful. Full of dandruff, and Kind of greassy and thick. Trying to figure aout what to do, bacause I dont want to use shampooo again. Are you using bicarb soda? If you are, try just using the apple cider vinegar. If not, it may have gotten greasy due to build up and the bicarb soda used for a short time might help to break down the grease again. 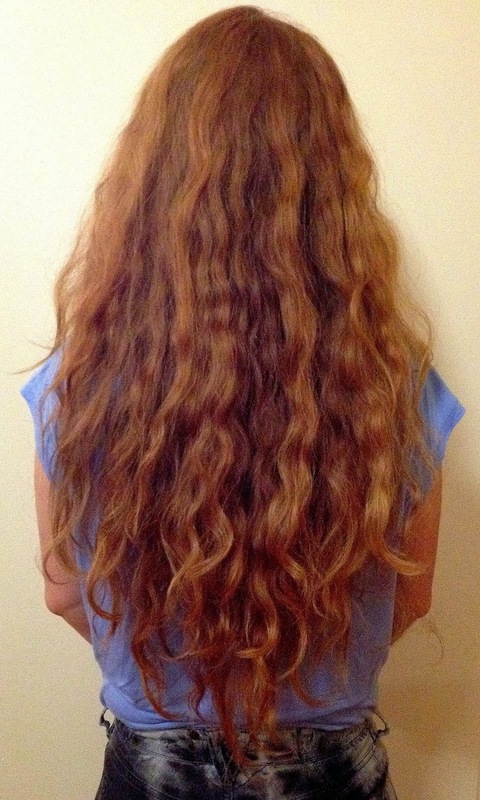 HI!, I also have long thick curly naturally red hair. I started the no poo last summer and loved it at first. But then my ends started getting very dry, ugly and breaking and my hair very flat, lifeless and greasy. I don’t want to go back to commercial shampoos though! Glad I found your blog! Going to try just the ACV… what about doing BS just on the scalp and not the ends every couple of weeks? I miss my wild mane of hair! I’m thinking of going No-Poo as I’ve been battling with dandruff for a few months now. I also have curly thick hair like you. It’s also somewhat long, but not as long as yours YET! Haha! My questions are besides the 1-2 times that you do the ACV washes, you only do water rinses to your hair? How often do you do water rinses? Do you use any conditioner when you do water rinse? I recently left a comment a while ago. I had another question. The times I don’t wash with ACV or baking soda, can I wash with a natural, pure soap? Because I put coconut oil in my hair and I was reading that coconut oil can’t come off with just the baking soda. What are your thoughts? I want to become a no-pooer and start using it on my daughter, she is mixed with super curly dry hair and think this will be great for her. My question is my hair is dyed black, will this strip the color out? I want to stop dying it too so I dont mind as long as it won’t turn funny colors. I’m really not sure about the effect on hair dye, sorry! Hi ! I am ready to give this a try! I was wondering about how often you would you use the bicarb soda and vinegar to wash the hair at the beginning stage ? Every day? Every other day? Less? Everyone’s hair is so different, unfortunately the best answer is “it depends”! I would start with washing every couple of days, and increase if your hair gets too greasy, decrease if your hair seems too dry. You could also alternate washes with bicarb (as in, sometimes use bicarb followed by vinegar, sometimes just use vinegar) as this is a little more gentle on your hair and scalp. Once I was past the transition period, and still now, I generally only wash with vinegar once a week and just hot water rinse every couple of days between vinegar washes. Although if I get extra sweaty or use sunscreen, I tend to vinegar wash a couple of times a week.